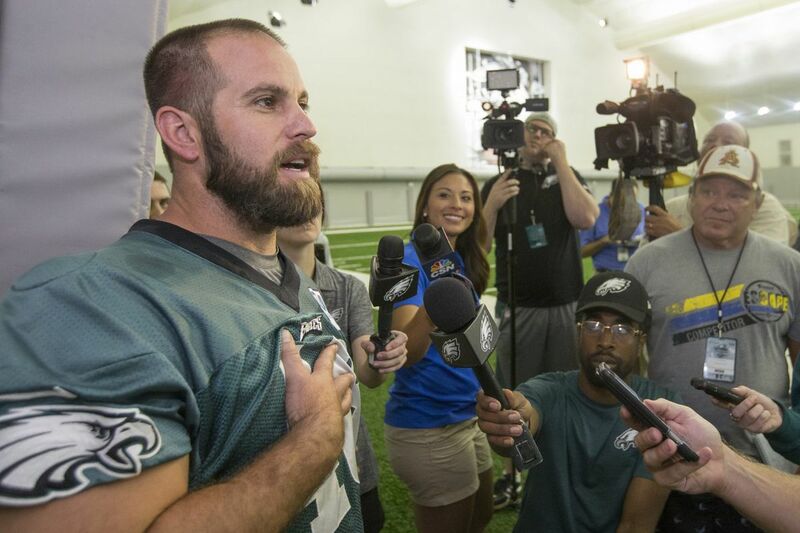 Jon Dorenbos talks to reporters outside an Eagles practice in 2016. A forthcoming film about the life of former Eagles long-snapper Jon Dorenbos will arrive soon than originally planned thanks to the Birds' Super Bowl win over the New England Patriots. As producer and Philadelphia native Mike Tollin told Deadline Hollywood, the film will focus on how Dorenbos used his love for magic as a way to cope with childhood tragedy — his father murdered his mother when Dorenbos was only 12 years old — as well as his career with the Eagles. The deal, Deadline reports, includes life rights, as well as an option for Life is Magic, a memoir Dorenbos is currently working on alongside former Daily News editor and current Philadelphia Citizen co-executive director Larry Platt. Platt has previously published books focusing on Philly athletes like Jamie Moyer and Allen Iverson. Dorenbos was traded to the New Orleans Saints last summer, after which team doctors discovered an aortic aneurysm during an examination. The team later released Dorenbos after placing him on the non-football injury list. Dorenbos has since undergone open heart surgery and retired from professional football. Prior to that, however, he made headlines as the magic-loving Eagles player serving tricks on America's Got Talent in 2016. He became one of the show's most popular contestants, but ultimately finished third for the season. Still, despite not being part of the team for their Super Bowl win, Dorenbos will receive a ring from team owner Jeffrey Lurie. As Dorenbos told Deadline, Lurie told him "you're an Eagle for life and you helped us get to this point." "I have learned that the sooner you accept your reality, the sooner you can look at the positives in life," Dorenbos told Deadline. "I am a slow, pudgy white guy who never thought he would play football. I made two Pro Bowls and guess what? All I did was stay on the path and show up every day, when others jumped off the path." Now, the Eagles Super Bowl win has "accelerated the movie effort," as Tollin told Deadline, adding that the film is still in development. According to Deadline, Tollin is working on hiring a writer, but already is speaking with "an A-list star" for the film. "This is about overcoming obstacles and turning tragedies into positives," Tollin said of the film.